While we heartily congratulate Senator Obama's campaign on their Wisconsin victory, the final results must be less than heartening to the Obama campaign. 1) Obama has a ceiling of 75% of Democratic primary support. Barack Obama has consistently won primaries and caucuses with only 75% or less of the vote. In addition to effectively disenfranchising the at least 25% of the Democratic electorate that is not voting for him, the Obama camp cannot be happy that their candidate hasn't reached 90% of the vote in any contest since the U.S. Virgin Islands on February 9. 2) Obama fails to win key demographics. Once again, Obama has not broken into the key demographic of voters who have been on a casino junket in the last thirty days. He also failed to win voters who had never heard of him, Wiccans, members of more than one bowling league, mourning dove hunters, white voters with "strongly negative" views of African Americans, and Vatican II-rejecting Catholics. These groups will only become more significant as the primary campaign shifts to Texas, Ohio, and Pennsylvania. Is there anything more romantic than trite partisanship? Such inane queries would actually reveal plenty, as you can bet certain candidates (usually those leading in the polls) would demur, deflect, triangulate ... whatever necessary to avoid offending a particular cola constituency, or, say, cashiers who work at Panda Express. They don't think very much of the American voter (and perhaps they shouldn't). Gov. Romney, I know you're a family man, so I'm guessing you know your way around a BBQ grill. Do you prefer charcoal or propane? Romneytron (insincere chuckle): Well you can't go wrong with a piece of USDA prime American meat, raised and fed by American workers right here at home, and I will fight for those workers, because I used to lay off people just like them, so I know exactly what they're going through. I know how to turn this economy around, just like I turned around the Winter Olympics in Salt Lake City. I promise you that if I'm elected we will have unlimited surpluses, lower taxes and we'll spend all the money necessary to help ensure my re-election in 2012. Sir, with all due respect you didn't answer my question. We all have a preference. I'm a charcoal guy, how 'bout you? Romneytron: I enjoy that rich charcoal flavor, particularly if the briquettes are made in America. So you're a propane man? Romneytron: That's a complete mischaracterization of my position. Look, I'm an outsider. I want to change Washington. I want to bring America together. Golly, I love this country. 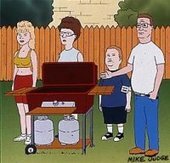 And one of the things I love most is that we are a nation that accepts people whether they prefer grilling with charcoal or propane. You think radical Islam let's people make those kind of choices? My position is clear. Romneytron: Jeepers aren't we all tired of this kind of gotcha politics? (inexplicable applause) And let me say this: John McCain supports amnesty, America is the greatest country ever, Ronald Reagan, I saved the Olympics, amnesty, change, God and Reagan. Open primaries typically produce candidates with broad appeal, mavericks who aren't afraid to challenge party orthodoxy. Eliminate independents and crossover voters from the process and you end up with divisive nominees who advance by placating their base. And who makes up the respective bases? Shrill partisans, mainly, people like Hugh Hewitt and Terry McAuliffe. For what it's worth, Mike and I ran into a Clinton insider last night who offered an additional twist on this argument: Not only does Clinton do better among registered Democrats than she does among independents and Republicans. But he thought registered Democrats would be especially inclined to give her a second look after Iowa and New Hampshire because they'd resent having their nominee chosen by a bunch of interlopers. Bush used this strategy to beat McCain in 2000. Think of this way: In a general election, would McCain have defeated Bush? Would Obama trump Hillary? Could there be a stronger argument against closed primaries? Shouldn't voters have more influence than parties? "Most people are in the middle of the road —- though they may stay in the left lane or the right lane," argues Georgia's former Sen. Sam Nunn, a Democrat and one of the organizers of the session. "The very extreme activists are in the ditch on both sides, and that's where the money is." It isn’t Gore’s vanity that is so impossible to stomach - it’s his total inability to own it. His vanity is the vanity of the ‘humble preacher’ - the deadliest vanity of all. If Hillary wins in 2008, Jeb Bush will emerge as the GOP frontrunner in 2012. And the dueling dynasties will live on. Are you ready for Chelsea (Clinton) vs. George P. (the half-Colombian Bush nephew) in 2024? "For the first time ever, a political party may have a major news organization in its pocket." I swear he said it with a straight face.